Yarna aims to bring new myths into being, and to perform them as accessible and playful maps that can be lead back to the heart, and back to Spirit. As we perform we also act in our capacities as healers, holding space and allowing safe and sacred space for hearts and imaginations to unfurl. 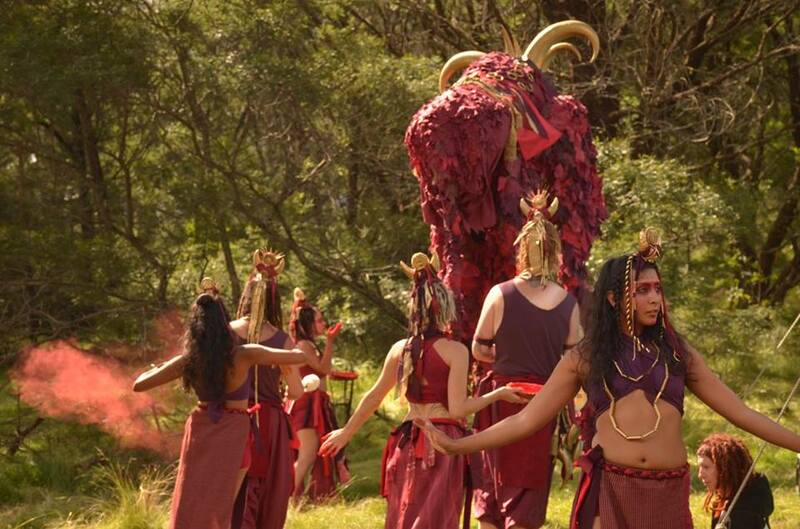 All myths are written, designed and choreographed by members of the collective. ANDASHA is a story celebrating awakening, the genesis of life, and exploring our relationship with the Sun and Moon. This is a two part performance, both parts lasting approx. 1 hour. Early in the day the women of the tribe gather those who will listen and tell the great tale of woe that is ANDASHA, while two ceremonial dancers passionately and colourfully enact the myth. At sunset the ceremonial procession is performed. 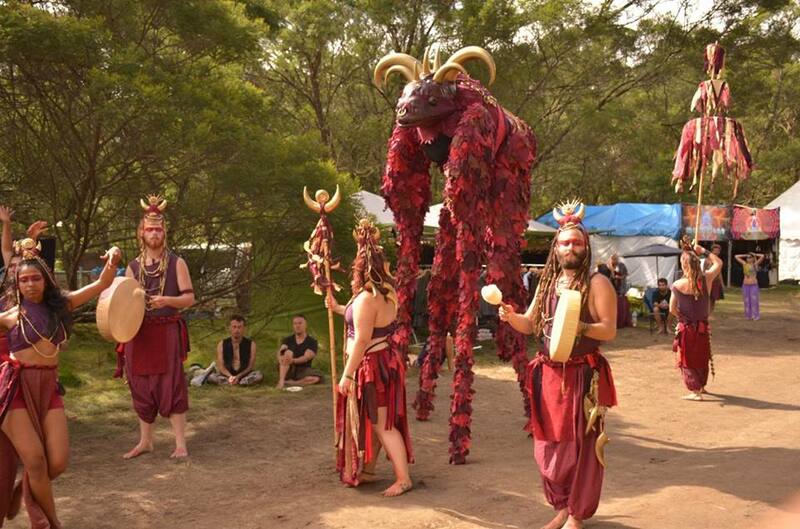 A spectacle of movement and sound, the tribe walk with a great, sacred beast, performing a ceremony as old as their people. Once there was a time before the light when a great love and a great sadness birthed the Sun and the Moon to fill the darkness with life and movement. To honour the gift of life, and to repent the act of violence that separated the lovers across the sky, the Priests and Priestesses of the tribe walk the landscape endlessly, carrying messages between the two celestial bodies. You can read the full story of Andasha here. With voices and drums, they sing the songs of worship and creation, while two dancers weave amongst the procession, performing the myth as it has been handed down generation to generation. Those who witness the procession are gifted with blessings and tokens and invited to join the ceremony, blessing the earth and trees as they are passed.